Learn valuable programming skills while building your own Minecraft adventure! 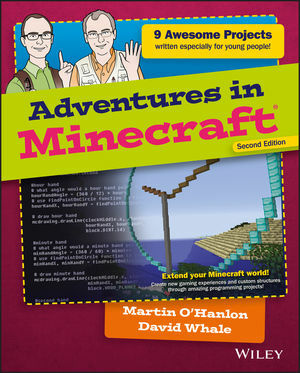 If you love playing Minecraft and want to learn how to code and create your own mods, this book was designed just for you. Working within the game itself, you'll learn to set up and run your own local Minecraft server, interact with the game on PC, Mac and Raspberry Pi, and develop Python programming skills that apply way beyond Minecraft. You'll learn how to use coordinates, how to change the player’s position, how to create and delete blocks and how to check when a block has been hit. Adventures in Minecraft teaches you how to make your favourite game even better, while you learn to program by customizing your Minecraft journey. Martin O'Hanlon (Birmingham, UK) describes himself as a professional geek and amateur snowboarder. Martin blogs about technology, Minecraft and Raspberry Pi at stuffaboutco.de. David Whale (Essex, UK) is a professional software engineer. He regularly volunteers for The Institution of Engineering and Technology, which provides support at many schools, public workshops and tech camps.